All Museum of the Big Bend Gallery Talks are Free and Open to the Public. Hanson is a Los Angeles-based artist whose works are in A Feeling of Humanity. She will make a powerpoint presentation on her painting style known as “Open-Impressionism.” The purpose of Open-Impressionism is to capture the true feeling of being out- doors, each painting more of an emotional work than a photographic representation. Fewer strokes is better in Open-Impressionism. Color choice is secondary. Texture and spontaneity are everything. 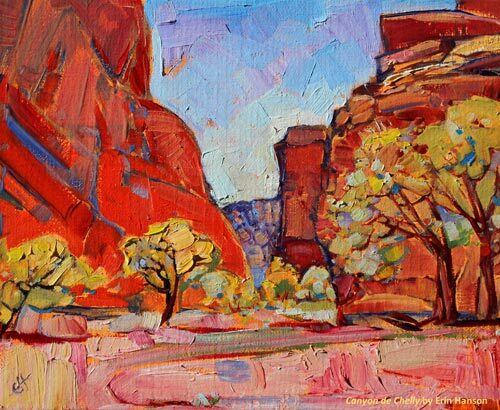 Hanson’s painting at left, “Canyon de Chelly”, is the main promotional image for the exhibit.